Referee Ryan Atkin says LGBT inclusion in football should not be focused on players, but off the pitch in order for it to become "everyday life". 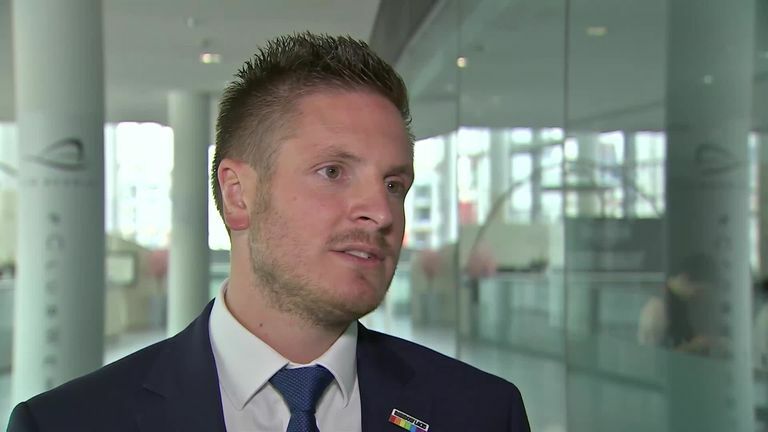 Atkin decided to come out publicly in August 2017 - making him football's first openly 'out' professional official in the UK - in order to help create an "inclusive environment" for other LGBT players, officials and supporters. He was also inspired by the Rainbow Laces campaign, run by the charity Stonewall and backed by Sky Sports. The campaign's mission is to 'make sport everyone's game', ensuring that all lesbian, gay, bisexual and transgender people can enjoy and be a part of sport. Atkin says while Rainbow Laces' success has helped promote inclusion and diversity within sport, further awareness and acceptance off the pitch would make it easier for anyone in the game to publicly identify as LGBT. "For me, it really shouldn't focus on players and I think Rainbow Laces really does touch on that quite a lot," said Atkin, speaking at Friday's Rainbow Laces Summit at Wembley Stadium. "While it is great that I'm active in the sport, and it's great that we've got racing car drivers and Nigel Owens and Gareth Thomas [who are openly LGBT], for me it's about everybody. It's a story from the stands, it's a story from a manager, it's a story from a ball boy, it's a story from the club doctor. "It really is that broad, and I think the more people who identify [openly], if they choose to, and are happy to discuss with their colleagues or fans their story, [the better]. What we want it to become is 'the norm', we want it to become everyday life so actually these interviews, the Rainbow Laces summit, won't need to take place. "And that's, for me, where this Rainbow Laces campaign has done so well - to promote diversity and inclusion, not just on the pitch, but off the pitch. "I think what it does is by taking a lot of pressure off the people who are feeling the pressure at the moment from the media, potentially, to come out and to sell their story or to give their story across the nation - actually, it takes away a lot of that pressure. "Once the stands and off the white lines are accepting and everybody is comfortable, I think it makes it a lot easier for anybody else within the game, who everybody idolises, to then have their story." The Rainbow Laces Summit saw sports leaders gather to learn more about creating an inclusive environment in sport for the LGBT community. What's going on with Hull KR's shirts? Sky Sports also attended the Rainbow Laces Summit at Wembley, presenting our campaign work on LGBT inclusion to leaders from across the world of sport. As a member of TeamPride, the coalition of businesses, brands and organisations that supports Rainbow Laces, Sky Sports activates the Stonewall campaign on screen, on social and on digital all year round, but particularly during November and December. We speak to people at elite and grassroots levels who help to 'make sport everyone's game' in their sports and their communities, bringing the message of inclusion to a wider audience.